This creative, colorful journal helps girls embrace their power through thought-provoking prompts. In a world where women are often told to be small, what if we asked a girl to imagine herself as a giant? Or to make a list of the things she wants to fight for? Or write love letters to her own body? This creative journal encourages girls to celebrate their power through dozens of writing and drawing prompts. 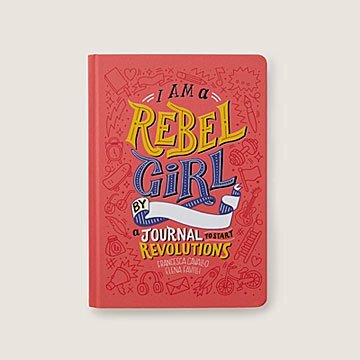 Inspired by Good Night Stories for Rebel Girls, the journal is filled with activities to challenge perspective, induce thought, and inspire action. From the ready-to-personalize cover to fun stickers, it helps girls express their thoughts and feelings while creating an interactive work of art. It's even illustrated by the same team of talented women artists who worked on the original storybook. (Let's hear it for strong female role models!) Give one to your daughter, your best friend's future feminist, your rebel niece...actually, go ahead and give one to every girl you know. Made in Canada. What was great about it is that this journal satisfied the prime requirement of the perfect gift and that is: "How did you know this is what I wanted when I didn't even know myself." Also the giftee's Mom, our Daughter-in-law, was surprised I was able to find this. She had heard of it yet, as it apparently available from outlets like Uncommon Goods, was too busy (3 kids) to do the investigative work. I gave this to a pre-teen niece who loves to read, draw, and write. She can skip around and use any of the pages that spark her interest at the time, and she doesn't have to do traditional journaling. This will spark her creativity and give her a space to explore her feelings, fears, and accomplishments. I hope she uses it for years to come!